The SOFIMUN Foundation has decided to have the 3rd edition of the SOFIMUN conference in the year 2010 in the period 24-31 July. The official media body of SOFIMUN - the SNN - SOFIMUN News Network has been launched! SOFIMUN's previous 1-st edition - 2008! 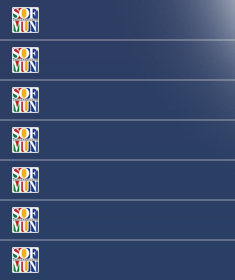 The SOFIMUN Foundation has decided to keep a full archive of the website of SOFIMUN 2008 event. You can go directly to it through the link bellow. 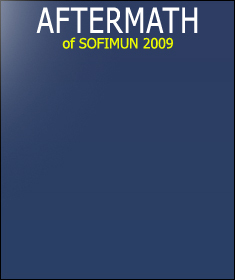 There you can find the aftermath reports of SOFIMUN 2008; galleries with over 500 photos; 3 videos and wallpapers. After a very successful first edition of the Sofia International Model United nations, it is my pleasure and privilege to invite you to the second edition of SOFIMUN. MUNs all over the world aim to raise the youth’s awareness of global issues that affect all of us. By preparing the young generations to face the complexities of the issues, SOFIMUN is proud to be one of the tools that help the young brightest minds to prepare for their future. It is with honor and great pride we invite you the Second Edition of the Sofia International Model United Nations. During one week, students from all backgrounds, ethnicities, and cultures will gather together in the beautiful city of Sofia and assume the role of a foreign diplomat or NGO representative. They will engage in debating, lobbying, and drafting resolutions in order to tackle the issues in their committees. Ultimately, the participants will also make friends from all around the globe which share goals and career paths, making this event a memorable opportunity for everyone. It is with great pleasure that I invite you to take part in this journey that can inspire you to achieve greatness. I invite all interested in International Politics, Human Rights, Environmentalism, Security, Business, Globalization, or any subject matter related to join us in Sofia. The Sofia International Model United Nations will be held July 18-25 2009. The SOFIMUN Foundation is proud to inform you that it is working forward on supporting and helping the international campaign for the establishment of a United Nations Parliamentary Assembly (UNPA). The SOFIMUN is the 1st MUN event in the world and the 1st organization in Bulgaria contributing to the idea. The campaign will be presented also to the participants during the SOFIMUN 2009 conference in Sofia, Bulgaria. The SOFIMUN Foundation is organizing initiatives in Bulgaria in order to find support for the idea to establish the first direct public representation in the United Nations Organization. The Campaign for the Establishment of a United Nations Parliamentary Assembly (UNPA) is a global network of parliamentarians and non-governmental organizations advocating citizen's representation at the United Nations. The Campaign's participants are united in their support of the Appeal for the Establishment of a Parliamentary Assembly at the United Nations. The list of initial signatories to the appeal has been made public in April and May 2007 during the launch of the campaign at more than one dozen events on five continents. The call for a UNPA now is supported by 642 members of parliament, further 2136 individuals from 132 countries and 173 NGOs on all continents. The first international conference was convened in November 2007 in the Palais des Nations in Geneva under the patronage of former UN Secretary-General Boutros Boutros-Ghali. 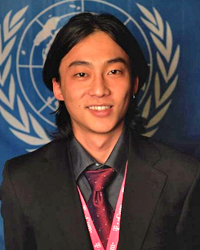 The Campaign's Secretariat is led by the Committee for a Democratic United Nations. The work of the Campaign is guided by an informal Steering Committee, which helps to define the Campaign's goals, policies and strategies. A United Nations Parliamentary Assembly (UNPA) would be the first parliamentary body directly representing the world's citizens in the United Nations. It is envisaged as first practical step towards the long-term goal of a world parliament. Now you can subscribe to receive by e-mail all the news we issue from now about SOFIMUN.